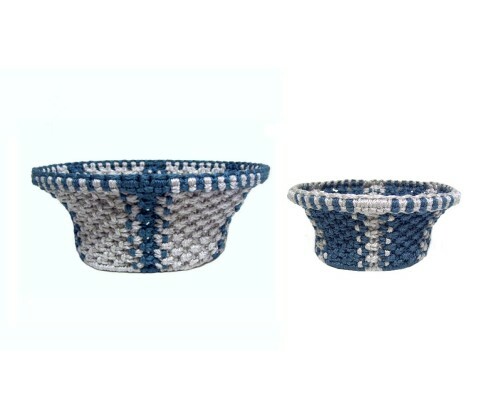 Description: The Contrast Basket features two colors, with one color used to form a striped design on the sides and bottom. The image above shows two color variations. The mounting technique at the top of the basket is unique. 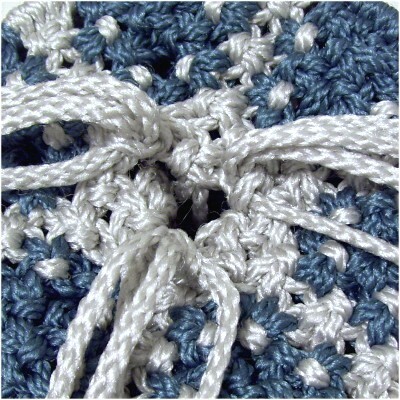 The Larks Head knots are surrounded by a Square knot design made with a contrasting color. This creates a more elegant appearance and makes the rim of the basket stand out more. 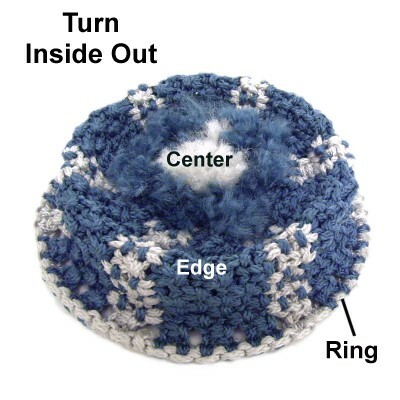 The bottom is flexible because there is no ring in that area. The cords are unraveled and fluffed on the inside of the basket. That provides a soft cushion for fruits, vegetables, or other sensitive items. The striped design is made with Square knots facing opposite directions, so be sure you can tie both right and left SK before you get started. Special thanks goes to Sharon Haddix for inspiring me to create this unique design. Step 1: You start the Contrast Basket by choosing which size you want to make, then use the chart below to determine the quantity and length of the cords. Important: The height of the basket is usually 1/2 the width. Increase the length of the cords if you plan to increase the height. Contact me for the formula, if you want to make a size different than what is shown below. I recommend the basket be at least 7 inches in size. The measurements below have been recently updated to make them more accurate. You may need to make adjustments to the length of the cords if the ring you use is thick plastic or wood rather than metal. Step 2: Divide the working cords cut with color A into groups of 6 cords. Divide the color B cords into pairs of 2 cords. In the images for the Contrast Basket, color A is blue and color B is gray. 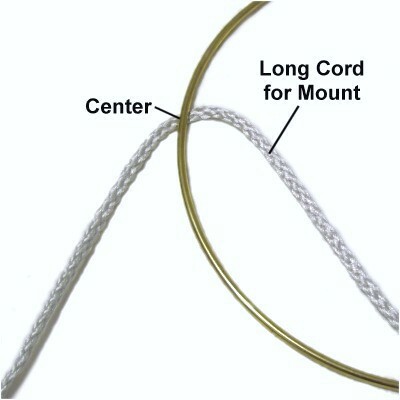 The long cord used for the Square knot mounting technique is attached first (color B). It is called the "mounting cord" in the instructions. 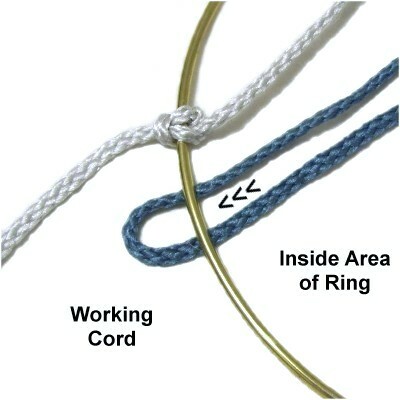 Fold the mounting cord in half and place it under the ring as shown. 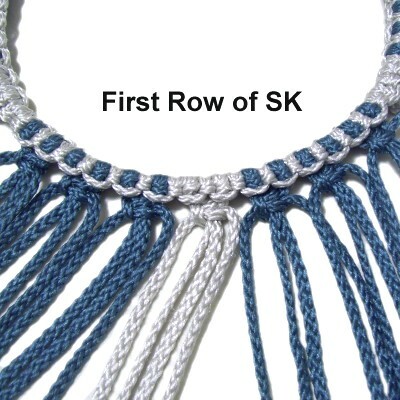 The SK are tied vertically along the ring. So you can hold the ring between your knees while you work. Pass the left half over the ring and under the right half, heading right. Then move the right half under the ring and over the left half, heading left. Pass the left half over the ring and under the right half, heading left. Pass the right half under the ring and over the left half, heading right. Step 3: Place one group of six color A cords close to you. Fold one in half and slide it under the ring. 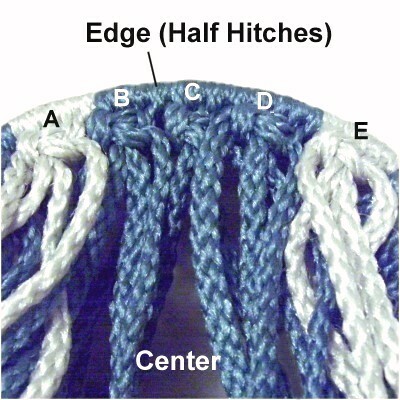 The fold should be on the outside of the ring, with the remainder inside it. 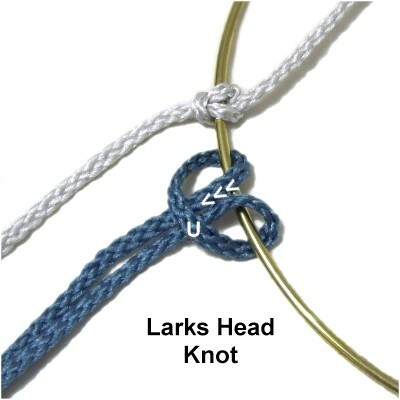 Complete the Larks Head knot by both halves over the ring and under the folded area. 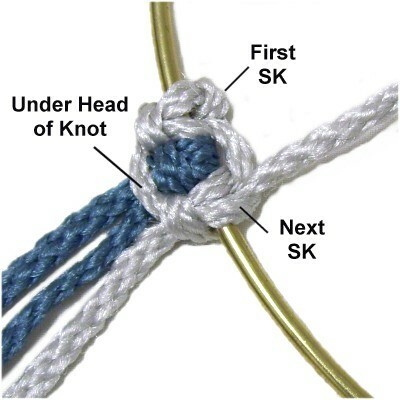 Tighten the knot, then slide it next to the Square knot. Step 4: Tie the next SK with the mounting cord, placing it on the other side of the Larks Head knot so it's surrounded. 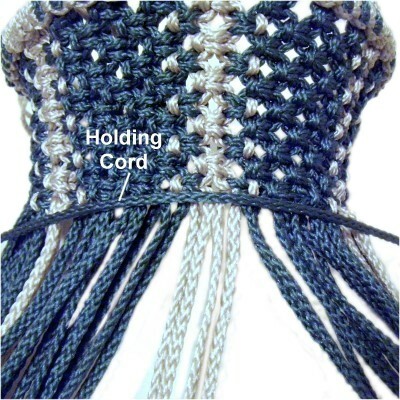 Make sure the mounting cord is not twisted, and rests under the head when you tighten it. Step 5: Repeat steps 3 and 4 with the remaining five color A cords in the group, tying one SK between each one. Then mount two color B cords, followed by six more color A cords. Continue this pattern until all the working cords are on the ring. Important: After you mount the last working cord, tie only the first half of another Square Knot, so the cords remain evenly spaced. 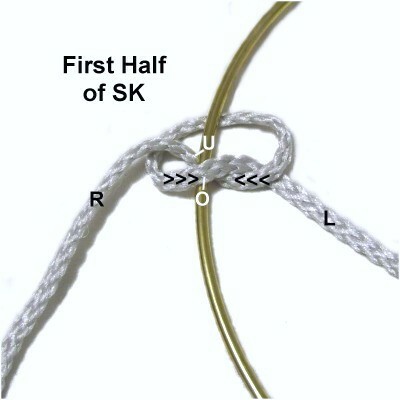 Locate the loop in the back of the FIRST SK you tied onto the ring. Pass the ends of the mounting cord through that loop, and pull firmly. The first SK and the last 1/2 SK should be touching each other. 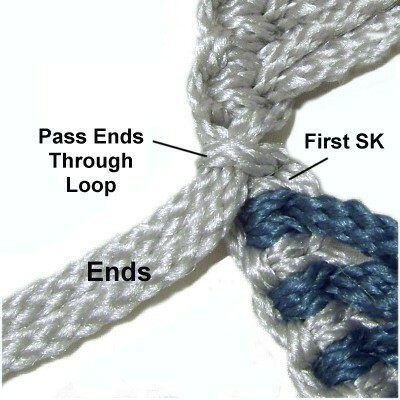 Tie the ends together and finish them off in the manner most appropriate for your material. Step 6: Tie the first row of Square Knots using groups of four cords. Start with four color B cords, then move all the way around the design. Tighten the knots firmly so they are close to the mounting knots. Important: The first row of ASK for the Contrast Basket can be done while the ring is flat on your board. 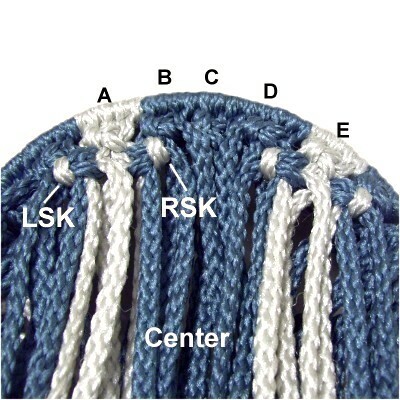 The remaining rows should be made with the ring upright or hanging from a hook in the ceiling. Step 7: For the next row, you need to alternate the cords. So locate one group of four color B cords as well as a group of color A cords on both sides of it. Mentally number the cords in each group. Then combine cords 3 and 4 from one SK with cords 1 and 2 from the SK next to it. These are the new groups for the second row of the Contrast Basket. Tie a LEFT SK with the new group on the left. 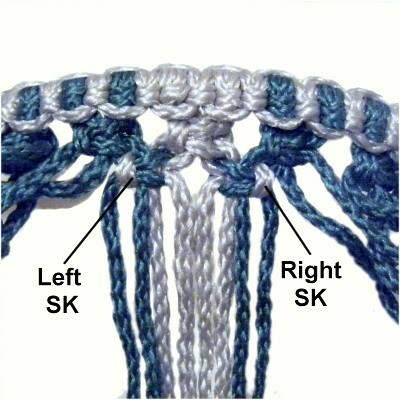 Tie a RIGHT SK with the group on the right. The heads of these square knots should be color B. Make adjustments if they are not. Designer's Tip: The rows of ASK need to be close to each other, or the Contrast Basket will sag. 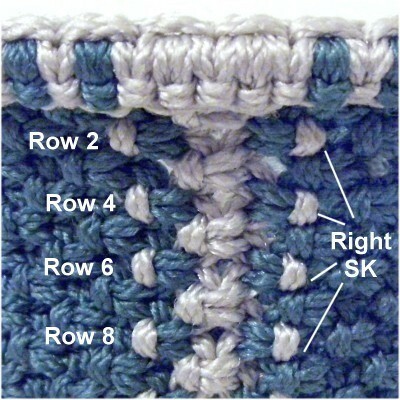 After each SK is tightened, pull the fillers firmly to eliminate any gaps between the rows. Step 8: Repeat steps 6 and 7 several times, until you have tied enough rows to result in a height 1/2 the ring size. So for an 8-inch ring, the height should be at least 4 inches. Stop on an even numbered row, where the colors are combined to form the stripes. 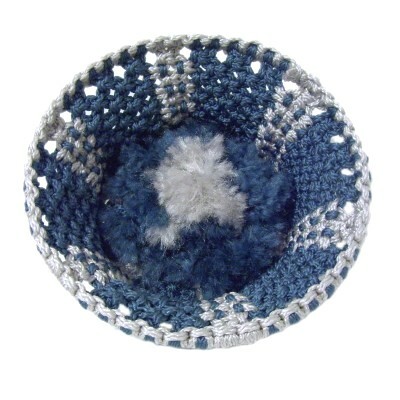 The lower edge of the Contrast Basket is made so you can fold the cords to create the bottom. This will create a flexible design, which is important if you are using it for fruits and vegetables. You can attach the cords to another ring if you prefer a more rigid bottom. Step 9: Measure the basket all the way around (circumference) close to the last row of Square Knots. Add 6 inches to that measurement, then cut one holding cord to that length. Arrange the holding cord horizontally, close to the last row of ASK. 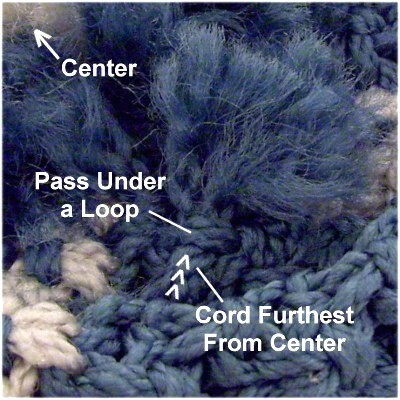 Move the holding cord as needed so one end is 3 inches from the place where you start the next step. Step 10: Mentally number the four cords coming from one SK. 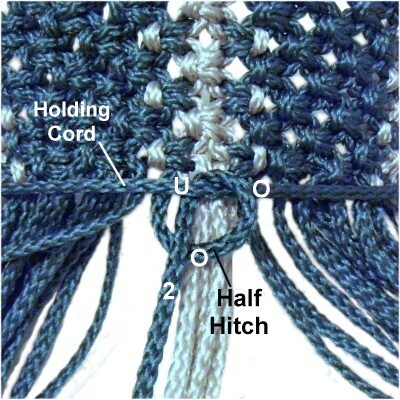 Attach cords 2 and 3 (fillers) to the holding cord with a single Half Hitch. Attach cord 4 with a double Half Hitch. 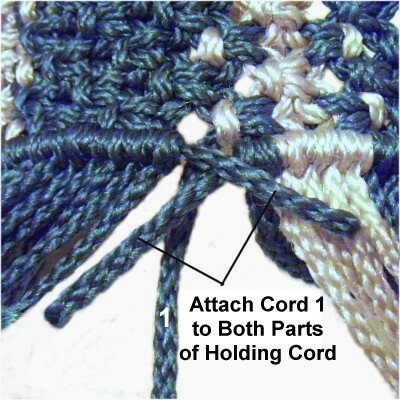 Do not attach cord 1 until the next step, so it's the LAST one you tie onto the holding cord. Step 11: Attach the remaining cords in the same manner. 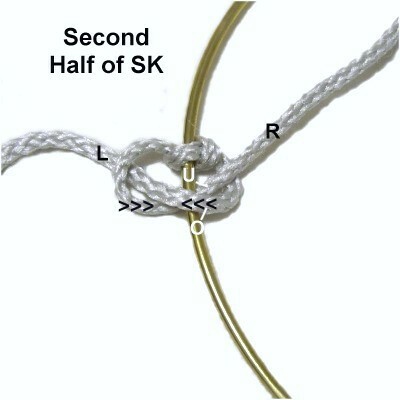 Cords 1 and 4 from each SK should be attached with a double Half Hitch. Attach cord 1 from the SK you started with, passing it around BOTH parts of the holding cord. Make sure you tie a double Half Hitch. Step 12: Turn the Contrast Basket upside down, then tie the two ends of the holding cord together. The knot should rest inside the basket. Shorten the ends so they are easy to identify. You should not use them to make the bottom. From this point onward, you will be making the bottom of the Contrast Basket. You should work on it with the basket upside down on your work surface rather than hanging. 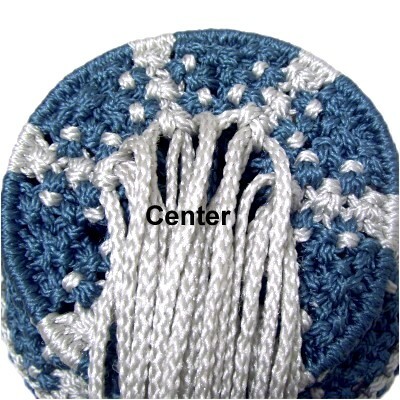 As you tie each row of ASK, you move from the edge (step 11) heading toward the center. You fold the cords so they are horizontal. The sides of the basket are vertical. Step 13: Tie one row of ASK with groups of four cords. 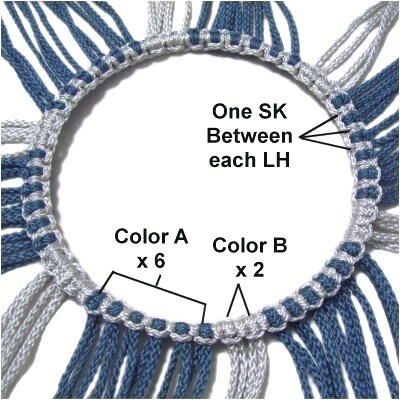 Start with four color B cords, keeping the same pattern as the rest of the basket. Mentally label the five knots starting from a color B on the left to another one on the right (total of 20 cords). 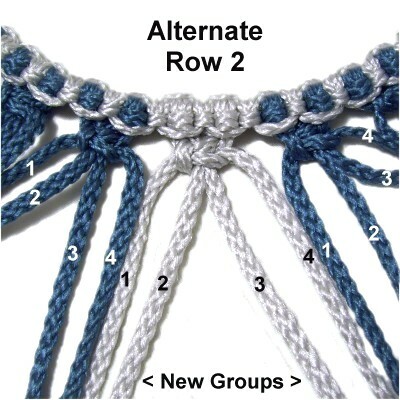 In this image they are labeled A - E.
Step 14: Alternate the cords for row 2, tying only the knots with combined colors, which come from the knots labeled A + B and D + E.
Remember to make the left and right SK as you did the rest of the basket. Step 15: Identify the four cords used to make knot C, which is color A. These four cords will be dropped (no longer used), to keep the bottom of the Contrast Basket flat. Push all four cords inside the basket. It helps to use a clip or tape to keep them out of the way. 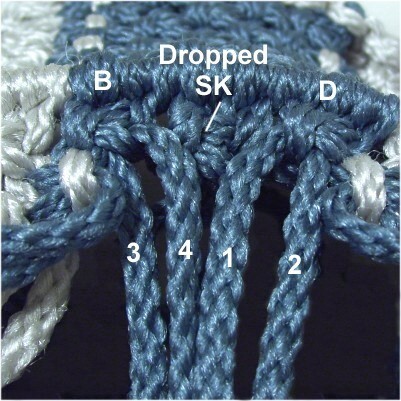 Locate cords 3 - 4 from knot B with 1 - 2 from knot D.
These are the only cords left in the 20-cord group, since the others have been used or dropped. 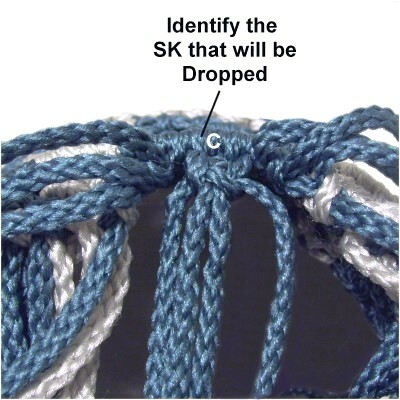 Tie the SK with the cords you just located from the knots labeled B and D.
Pull the cords as you tighten to move all the knots closer together. The dropped SK should be covered, so the gap is as small as possible. Adjust the tension as needed, so the knots lie flat. Step 16: Repeat step 14 and 15 with the remaining cords, to complete row 2 for the bottom of the Contrast Basket. Step 17: Tie the remaining rows, moving toward the center. Drop color A cords every row, or every two rows (depending on size). Designer's Tip: The number of rows you tie will depend on the size of the basket. 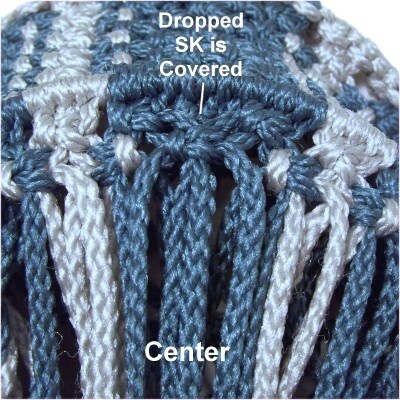 For the smallest size (7-inch), drop one SK in each section every row. The larger sizes (8 -10 inches) will require you to tie more rows, so you can drop cords every other row. Step 18: Continue to drop color B cords every row, tying enough knots to completely close the bottom of the basket. Make sure the bottom remains flat. You can tie Square knots without fillers if necessary. Step 19: Push all the cords inside the Contrast Basket. Trim the color B cords down to 1-inch long, then unravel them. Do the same with the color A cords closest to the color B cords. The cords further back from the center need to be brought closer to the others. 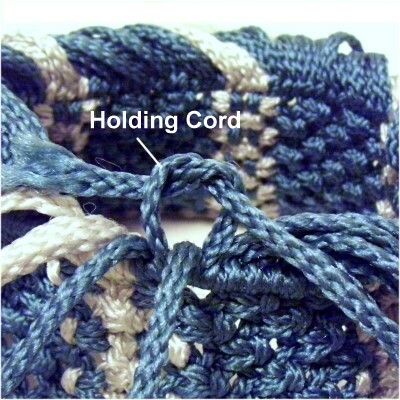 This includes the ends of the holding cord (from step 12). Pull each cord under one or more loops, heading toward the center. Apply glue to hold them in place. When the glue is dry, trim the cords to 1-inch and unravel each one to create the soft bottom. Turn the basket back to the way it's supposed to be, and you're done. Have any comments about the Contrast Basket? Contact Me.